Nearly 150 members and guests came together to celebrate the achievements of individuals in the industry and within organisations the Company supports in training and education through its charitable fund. Prize winners for this year’s BMF students were Ryan Edwards of Kellaway Building Supplies, Georgina Bennett of Robert Pochin Ltd (main image, bottom right) and Paul Clifford of Elliotts. Nominated by his tutor, Ryan was awarded an engraved tankard and a cheque for £1,000 for ‘Best Student’ on the BMF Diploma in Marketing. Georgina received an engraved goblet and a cheque for £500 for the ‘Trade Supplier Apprentice of the Year’ award. Her manager felt Georgina’s enthusiasm, and strong character and determination to learn and succeed in what can be a ‘tough industry’ for young individuals made her deserving of the prize. Paul was presented with an engraved goblet and a cheque for £500 for ‘Best Online Student’. He completed 58 courses at an average score of 85%. An additional element to this year was to introduce two new awards and also recognise the great contribution of the Livery and its members to building a new community space in a deprived area of London. Organised and led by the charity ‘Build Up’, over £20,000 worth of materials and tools were donated by builders’ merchants Lawsons and Lords and suppliers Makita and Toolbank. In addition, NMBS purchased high-vis jackets for use on the project and WCoBM donated £2,000. 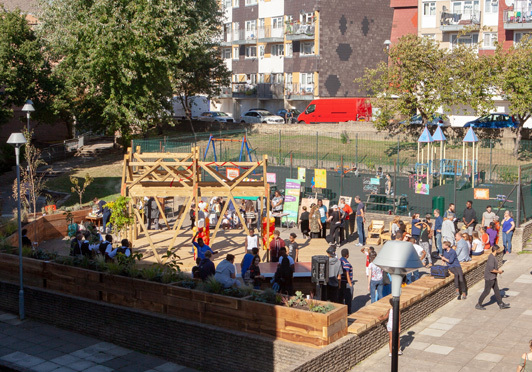 Fifty 11-23 year olds worked together to build a pergola and garden, with seating and table tennis on an area of tarmac that had been empty since the estate was built. In the words of Build Up’s Director Huan Rimington: “All young people need opportunities to fulfil their potential,” and this project certainly went some way to achieving that. Accordingly, WCoBM’s new ‘Leadership Awards’ were presented to teenagers Joy Muiruri and Rokia Khelouda for their hard work on the project and in planning the opening event. 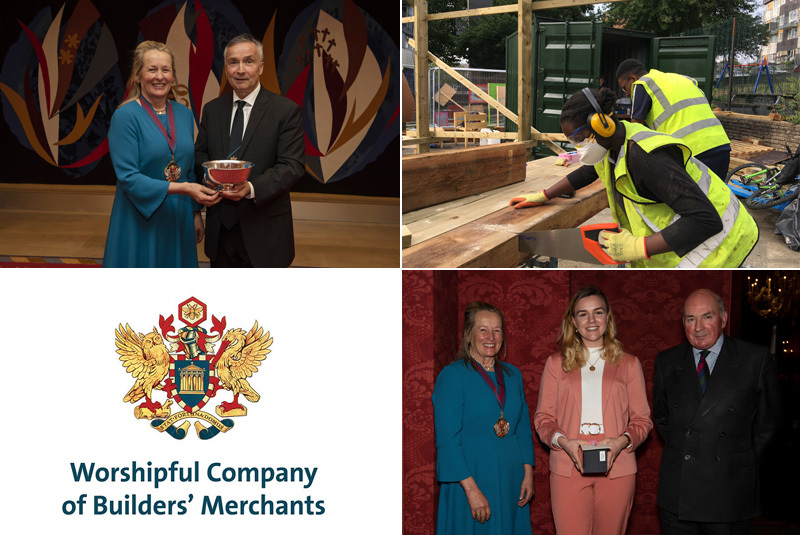 The last award of the afternoon was presented to Liveryman and Court Assistant Simon Lawson, Chairman of Lawsons Timber, Building & Fencing Supplies (main image, top left). Initiated by the Master Pippa Latham, this award is for Liverymen who demonstrate strong leadership and philanthropic insight, making a real difference in our industry and a tangible benefit to society. The Master commented: “Lawsons has a ‘triple bottom-line approach’ in that it aims to make a profit, give back to the community, and minimise its environmental impact. The spreading of its ‘family values’ into wider society illustrates how a Liveryman can make a difference to the lives of individuals.